If you have allergies to Soy, please contact your healthcare professional before use. 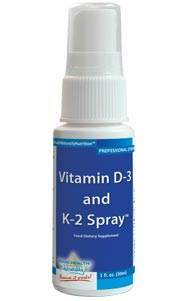 The answer is Good Health Naturally Vitamin D-3 and K-2 Sublingual Spray? You may have been taking a vitamin D3 supplement for some time, thinking that you're receiving more than enough bone support. But new research suggests that vitamin K2 plays a critical role in the process. For decades, vitamin D3 and vitamin K have been considered 'stand alone' vitamins. But really your health can't benefit from one without the other, It's true! This process creates calcium deposits in injured tissue. If damage occurs in your blood vessels, watch out - you're looking at plaque build-up that can soon lead to a heart attack. In combination, vitamin D3/vitamin K2 boost a protein called MGP that protects blood vessels against calcification. The vitamins work hand-in-hand to protect your heart against cardiovascular disease. Contrary to popular belief, more calcium in the diet won't prevent osteoporosis. Calcium supplements that can't be broken down by your body will create hard deposits in soft tissue that could soon enough cause premature aging, coronary artery disease, obesity, diabetes, and osteoporosis. Your body needs vitamin K2 and vitamin D3 to support calcium absorption and reabsorption for effective bone mineralization. If not, you'll have countless calcium deposits throughout your body that bad bacteria feed on and form hard shells around. These shells can trap toxins and environmental chemicals inside the deposits, attracting even more bacteria and viruses. Ingredients: Diglycerides of fatty acids (coconut source), Vitamin K2, Vitamin D rich lichen extract, natural Vitamin E from Soy.